Being a service club, our focus is often on Fund Raising in support of our mission. But we also need to raise funds to support the club operations: paying insurance, PO Box, Travel expenses to various meetings, hosting an awards banquet and oficer installation. Our major focus for raising these funds is hostessing Parties -and- attending Parties (and paying for the opportunity). So while raising funds, we are having FUN (thus, FUN-raising) and growing closer bonds to one another. Our parties are open to others: cotact our President if you are interested in joining us! Super Summer Salad & Such Margarita Potluck! Presentation on a slice of life in Ecuador. Ecuadorian snacks provided! SOU Raider Women Soccer Game! Tons of fun rolling the dice - easy to learn & play! 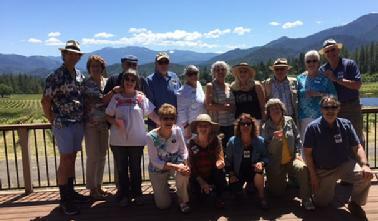 On Friday, May 26th, at 11am, sixteen of us boarded our bus and headed out on a fabulous, fun, filling, and educational tour of the Alexander Valley. We visited Troon, Serra and Wooldridge Creek vineyards with tastings at all and a barrel room tour at Wooldridge Creek. We had appetizers at Troon, lunch and a very decadent chocolate desert (which went quite well with our red wine tastings) at Serra. Our tour guide, Jim, was a retired biology teacher who also had a small vineyard on his property and produced his own wine. So needless to say, he was an excellent and entertaining guide. We arrived back in Ashland at a little after 5pm after enjoying some wonderful wine and each other's company. Guests will bring their own containers, pick & pay for plants to fill them with, and enjoy creating summer scenery. Potting soil, and tailgate-style refreshments included. Hosted by Colleen and Gail at Gail's home. Attendees will learn to make four different sauces that they can take home. Refreshments will be provided. Food and drink provided and this party is always a blast! Attendees gathered to enjoy some munchies, drinks and visiting before cheering on our very own SOU WOMEN'S SOCCER TEAM!